Exercise is very important and bringing your kids up with natural exercise could have them leading a life that is better. If you exercise as a family it can also be a time when you reconnect with everyone, and just have a fun time. It will help to release the stresses you’ve experienced during a hectic week and also help to keep you close as a family. There are many exercising methods the whole family can partake in, that you should use for these times. They are easy to do, and before you know it this exercise time will seem like something that is a natural part of your weekly or daily ritual. You as a parent should set a good example for your children, and making sure they stay healthy with what they eat and how much they exercise is a great example for them. You don’t have to spend a long time either, a simple 30 minutes each week at least three times a week, will be just fine. This will help not only you stay in shape but keep your children from becoming obese, and a statistic that seems to be on an alarming rise in the world today. Make a time, whether you pick right after school or after you’ve finished your supper for the night, and be sure to stick with three times a week. Younger kids may love something like hide and seek, tag or even hopscotch. You can make it a fun activity where everyone is moving. While older children will be able to enjoy, a game of catch, or kicking a soccer ball around, even basketball if you have a court near your home. On weekends mix up the activities, if you have a park in your area, go and hike on the trails that are around the park. Or look for other places to hike, be sure to take water and snacks that are healthy along. You may have to recharge your batteries, so a mix of nuts could help make sure everyone has fun and doesn’t run out of energy. 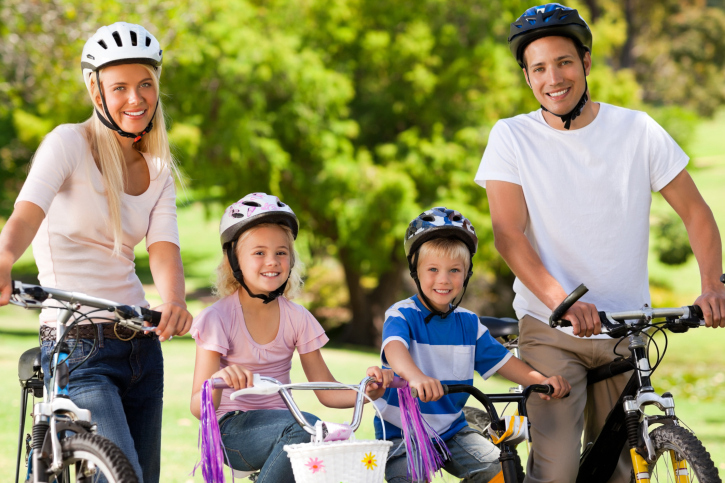 Bicycling is another fabulous activity that you can do as a family. Even if you have younger children they have attachments that have a stroller that you can place on your bike. As you children get older they will be able to enjoy the bike ride just as much as you do. You can even just add in a walk now and then. If you have to go the store and it’s only a short walk, why not take the family out. Of instead of watching some show on TV, go for a family walk around your neighborhood.